Halls of Judgement is a new game hitting Kickstarter in early May! 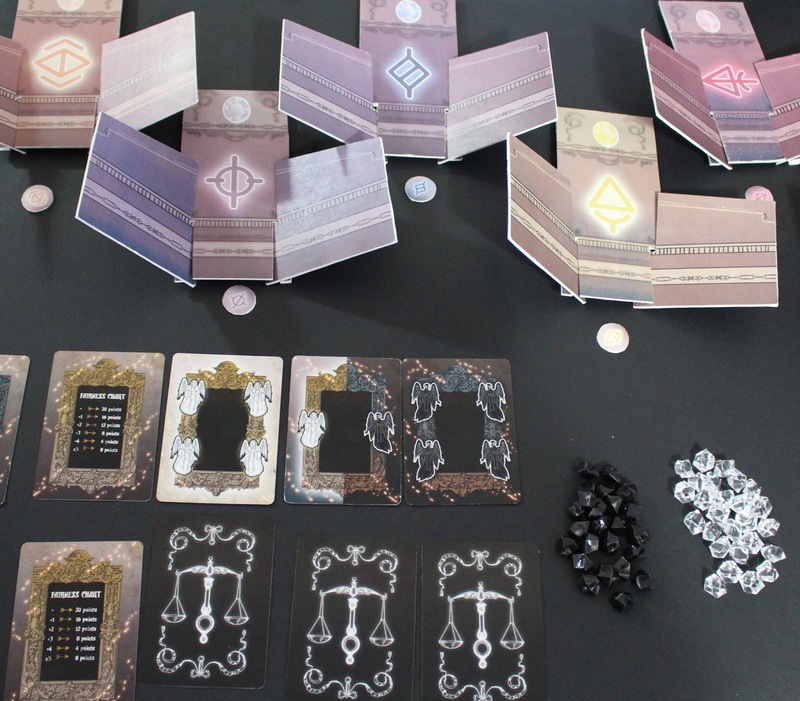 The game is card collection game where players take on the role of a god bidding to win the souls of the newly departed. good, 8 evil) that are used to bid on souls. Any leftover power gems can be used to turn followers into Harolds (for victory points) or are discarded at the end of the round. At the end of the 5 rounds players tally points for fairness (amount of good vs. evil followers), and hidden objectives. The player with the most victory points wins! Halls of judgement is a card collection bidding game where you are competing against other gods for the souls to become your followers. There are good, evil and neutral followers. The good and evil followers number from one to four and the neural followers are worth two. All bids are hidden from the other gods as you try to collect as many souls as you can based on your secret objectives. You bid with power. While the components are likely to change between now and the time that the Kickstarter comes out I did want to point out the great quality of the prototype that we received. The artwork was very thematic, the gems/soon to be wood cubes were nice and we can't wait to see what it looks like when everything is said and done. 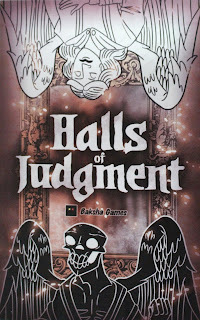 Halls of Judgement provides a quick 2-6 player card collection game with a bidding mechanic. The game would be good for larger groups looking for a filler, or those who like to play on the go - the small footprint makes it ideal for travel. While we liked the art and thought the the theme was great, there were some problems that would likely be solved with a higher player count. Each round the power gems from the previous round go away and players get new cubes, limiting the potential for strategic bidding. There were a number of times when we were playing where I had extra power gems that I couldn't use and were just discarded. However, with more people bidding it is likely that all the gems would be spent each round. The scoring mechanic was also a little tricky to master, with negative and positive points being assigned, but once you get a handle on it it adds an extra dimension to the game. All in all we look forward to watching this game on Kickstarter.